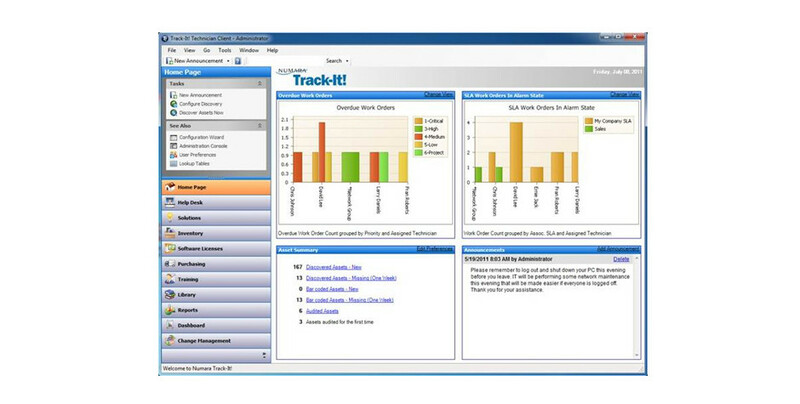 Track-It!® family of IT Management solutions gives you the ability to immediately take control of your Help Desk and IT Management functions with included core modules for Inventory and Asset Management, Help Desk Management, Problem and Incident Management, Change Management, Purchasing, Software License Management, Training and Library, Facilities Management, Self Service Web portal for end users, Mobile Help Desk interface for technicians, a data warehouse driven Dashboard for metrics and Reporting. Why choose BMC Track-It! ? BMC Track-It! gives you the help desk essentials: ticket tracking, change management, process automation, and inventory and asset management. It’s usable, affordable, and installed on site. With BMC Track-It! IT help desk ticketing system, you get the strength of ITSM best practices with the simplicity of smooth installation, quick configuration, and rapid ROI. Plus, the user-friendly interface makes it easy to report issues and request services without any tedious training. 50,000 organizations have trusted BMC Track-It! as their core help desk ticketing system. They also enjoy the extras that take Track-It! from no frills to no problem. Robust asset management, on-the-go mobile access, web-based self service, and PC migration capabilities all provide bang for your (very reasonable) buck. Learn More about BMC Track-It! What’s New in BMC Track-It!